18" stake, 15' tie out cable. 360 rotation - no tangle. 1700 lbs tension strength. 18" stake, 15' tie out cable. 360 rotation - no tangle. Tie Out Stake & Cable Combo. 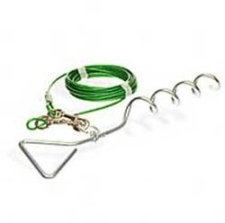 Tie Out Stake & Cable Combo keeps your pet at home.